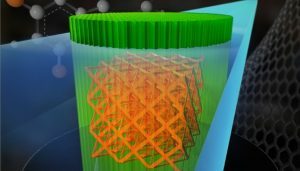 Researchers at Lawrence Livermore National Laboratory (LLNL) have cracked the code to enhance the capability of Two-Photon Lithography (TPL), a method used for 3D printing at a nanoscale, by enabling it to print features less than one-hundredth of the width of a human hair. This research will also enable doctors to augment the potential of X-ray CT scans by non-invasively study and analyse a patient’s 3D printed implant for stresses of defects. Two-Photon Lithography (TPL) is a 3D printing technique which is widely used in medical field to print features at the nanoscale. It can easily print Nano features that are smaller than the tip of a laser. It is the only process which can print such minuscule features as it can easily bypass the usual diffraction limit. It does this because the resist material which cures and hardens while printing simultaneously absorbs two photons instead of one. Researchers have optimised the resist material for TPL and so it can print structures smaller than 150 nanometres. Previous methods printed the structures from the base to the top thereby limiting the height of the structure to about 200 nanometres because it is the distance between the lens and the glass slide. LLNL researchers have turned the entire process upside down by putting the photoresist material directly on the lens and the laser passes through it to build the structure. With this simple idea now structures can be built up to millimetres in height. In addition to this, the improved resist material can absorb an increased amount of X-Rays improving the comparative attenuation by more than 10 times. Lawrence Livermore National Laboratory (LLNL) is well-known for its strenuous researching capabilities in the field of advanced materials which mostly revolves around 3D printing. This is not the first time that they have featured in a groundbreaking research. 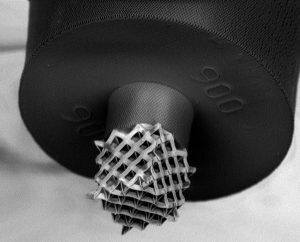 A team of researchers from LLNL have already developed a new technique that helps to bring 3D printing time down to just a few seconds. A process which they named as ‘Volumetric 3D Printing’. 3D Printing is attracting researchers from across the globe and we are seeing potential breakthroughs almost every other day. The nanoscale printing potential is huge and it can have a profound impact on the application of 3D printing in the medical field.